My heating turned itself off overnight. It's back on now but the house is bloody cold. I have just watched last night's Emmerdale. I have never watched Emmerdale before, and I am glad about that. It really is an awful programme. However, the reason I watched it was because Paul Darrow was in last night's episode and will be in it for a few weeks. He really was the only highlight. He plays a totally over-the-top motorcyclist called Eddie - the role suits him down to the ground. And he had a classic line delivered in a way only Paul Darrow can - "I have a tiger on my backside; do you want to see it?" I've had my cholesterol checked again. Back in October 2008, my cholesterol was high at 6.4 with my bad cholesterol level at 4.2, and that should be below 2. I thus went on statins. In March this year, my cholesterol had fallen to 4.9 and bad level to 2.6. Now, my cholesterol level is 4.6, which is slightly better but she said they couldn't measure the bad cholesterol level because the amount of triglycerides in my blood was too high. This apparently is caused by drinking a lot of alcohol. I do recall that I had a hangover when I had the cholesterol checked, so must remember not to go out the night before my next check. I have a hangover and I'm trying a hangover cure I used to use when I was younger - drinking black coffee while listening to Black Sabbath. It still seems to work. There has always been a problem, a little ironic, with democracy and that is sometimes the wrong people get in. This is OK to a limit, and that limit is when those who get in are an extreme anti-democratic fascist party, such as the BNP. We all know what happens when the fascists gain real power, as was witnessed in Germany in the events that led up to World War II. That must never be allowed to happen again, and if that means denying democratic rights to fascists parties such as the BNP then so be it. Sometimes the greater good means restricting democratic rights, and I believe that this now has to be the case with the BNP. They should be made an illegal party and denied the right to stand in elections. It should be a criminal offence to belong to them. I only took a small number of pictures at LX, this year's Eastercon in Bradford in April, and most of those were of the beer tasting session. A company has asked me to quote for creating a Wikipedia page for them. The writing part of it is no problem, but can someone please let me know a little of what is involved in creating an entry? Do I need an account to do this? Do I have to pay anything? Are there things I should know? Any help or advice gratefully received. I don't think I've ever had such a difficult decision to make for an election. My general tendency is to vote left, but I also do not see the point in voting for anti-EU candidates in the EU election, and the main left candidate from the Socialist Labour Party is anti-EU. Even if I was anti-EU, I think it would be pointless to vote for an anti-EU candidate. The EU does not decide whether Britain is a member of the EU, the British parliament does that. As Britain is in the EU, you need MEPs that can represent their constituencies enthusiastically and the anti-EU brigade can't do that. I also don't want to vote for any of the three main parties as they deserve a bloody nose after the expenses scandal. That really leaves the Green Party as a leftish party that is pro-EU, but I also disagree with the whole idea than humans cause global warming as a fact. It is a theory and one of many theories. So, a dilemma. I think the Green Party just edges it, but I'll make a final decision after sleeping on it. I had to go to London today to attend a press conference. This should have been a fairly straightforward affair as Nottingham is less than two hours by train from St Pancras. All was going fine until the train sped through Bedford station, a mere half an hour out of London. As we went through the station, there was a bang followed by the train wobbling uncertainly and then the driver hit the brakes and we came to a sudden halt just south of the station. The burnt smell from the brakes was very evident. An announcement came rather quickly saying that there had been an incident and that we would be here for some time, and drinks at the buffet are now free. They don't normally give free drinks away that quickly, so it was obvious something serious had happened, confirmed shortly afterwards when a procession of paramedics walked past the window on the way to the front of the train. It was as we suspected, someone had gone under the train, whether a suicide or an accident I still don't know. We did eventually get to London - after they'd removed the body and found a reserve driver - some two and a half hours behind schedule. I rushed to the now finished press conference and managed to get a private briefing. The tube journey back to St Pancras was long due to signalling problems on the Piccadilly Line. And when I got to St Pancras it was chaos as a knock-on from this morning's incident. The railway staff talking to passengers were clearly frustrated as no-one had given them any information about which trains were going when and from which platform. I eventually caught the train I had a ticket for, though somewhat late. I just nipped down to the local library to see the full list of candidates, and it would appear that four parties haven't leafleted me yet - English Democrats, Libertas, Socialist Labour Party and the curiously named Jury Team. Nearly a week had passed since I last got an election leaflet through my door until this morning; it seems hopefully that as election day nears the parties are running out of steam. Today's flyer comes from No2EU-Yes to Democracy and would win if the competition was to have the most non-catchy name of any political party. In reality, they will probably get few votes as they are yet another anti-EU group with the exception that this lot seem to be approaching it from the left rather than the right. They need to do something about their timing as the leaflet advertised a public meeting last week in Leicester and one tonight in London. Their appeal is obviously left wingers who are anti-EU and wouldn't touch the racist UKIP and BNP with a barge pole, and it would be good if they could draw the anti-EU voters away from them. But a two-sided black-and-white A5 flyer advertising meetings that have already happened is not really going to have a big impact on the electorate. 1. United Kingdon First Party. I've obviously not been paying attention because I'd never even heard of this lot. Looking at the leaflet, they seem to be a UKIP lookalike with wanting to pull out of the EU and restricting immigration. They are also calling for an end to political correctness, which I presume means allowing people to be racist and sexist etc. The one-sided A4 leaflet contained grammatical and punctuation errors, which was amusing given one of their calls was "English language for all". 2. Conservatives. An odd-sized gatefold flyer with David Cameron's picture on the front with the pictures of the candidates relegated to inside. Wanting to keep the opt-out to the EU's working time directive would be a vote loser for me to start with, though in fairness I can't imagine any set of circumstances that would lead to me voting Tory. The leaflet is quite professionally produced and contains a balanced mix of local and national issues. I couldn't be bothered to count the number of times it used the words "British" or "Britain", but it was a lot. 3. Liberal Democrats (or Lib Dems as they appear to be calling themselves now). These are the Tories in disguise, and while this flyer doesn't mention Britain quite as often as the Tory leaflet, it does have a prominent Union flag. This is a more traditional A4 gatefold leaflet, done landscape. The paper is poorer quality than the Tory leaflet (actually even poorer than the UKFP flyer). Again, it has gone for a nice mix of local and national issues. It suffered from a bit of a printing problem in that some of the apostrophes haven't appeared (there is a space instead, which is why I think a printing problem rather than apostrophe ignorance). 4.Green Party. An odd, little two-sided square flyer. One side is dominated by a picture of four children on a beach holding a banner saying "Vote for us" with the name of the candidate in the top corner. The other side has a couple of headlines about voting for the country's future and contact details. There is not a single policy to be found. I presume a follow-up flyer is on its way. 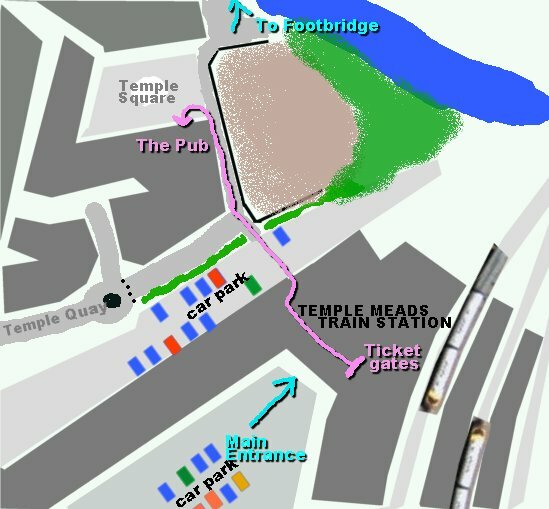 The next Bristol Beer & Blake's 7 pub drink will be on the afternoon of Saturday 18 July, all welcome. When: Saturday 18 July from about 12.15pm till about 7pm. I'm up early because today's the day I head for Wembley to see Shrewsbury Town face Gillingham in the League Two play-off final.